Businesses can suffer significant financial losses when the power goes out. And now that commercial solar has a solid foothold and organization are realizing tangible savings, many owner/operators are looking for ways to extract even more savings and security from their solar investment. In addition, most utilities are actively re-examining their net metering policies, and reducing the credits they offer for any excess energy sent back to the grid by your solar energy system. Batteries and other energy storage systems allow you to keep your excess energy for use when and how you see fit. No need to sell it back to the utility at a reduced rate. While each commercial-grade energy storage system is unique, most fall into three basic categories: emergency backup, peak demand shaving, and full off-grid systems. The first two categories require dramatically less capacity and generally cost much less than a full off grid solution. Let’s take a quick look at all three. As our national energy grid continues to age, more frequent power outages are a certainty. If you already have a solar on your business, you are more prepared than most. 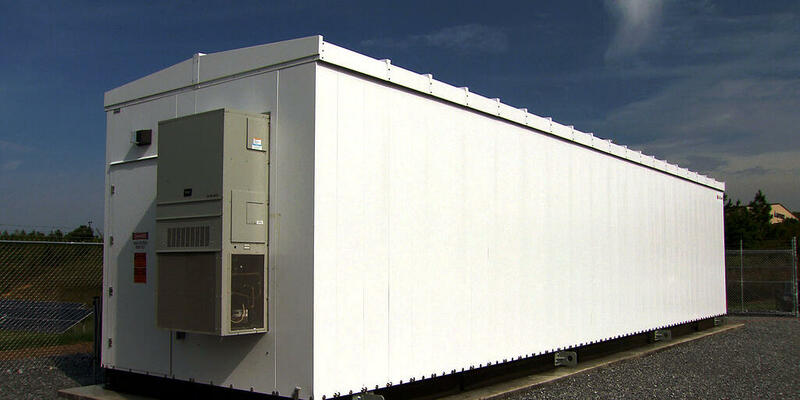 A commercial energy storage system will allow you to expand security around the clock for your most critical power loads. For much less money than a full off-grid system, an emergency backup system will provide just enough energy to run your most critical loads at night while the grid is down. When the sun comes back up the next day, your solar panels will recharge the batteries for use again the following night. This cycle continues until grid power is restored. Arizona utilities are moving swiftly toward demand-based rate plans that add new fees for the highest single hour (APS) or half hour (SRP) of energy drawn from the grid during the billing cycle. Energy Storage can help mitigate these fees—allowing your business to flatten demand peaks by drawing from stored solar energy rather than grid energy when your demand peaks. These systems require much less overall capacity than a full off-grid system, and generally offer the fastest ROI. environments designed to help maximize efficiency and longevity of the system. Different types of businesses have vastly different electrical requirements. A manufacturing facility, for example, will use way more electricity than an office complex or church. Providing enough storage capacity to take the office complex completely off-grid is significantly easier and cheaper than supplying 100% of a factory’s electrical needs. Full off-grid systems typically include energy storage, environmental systems to keep the batteries cool, and generators for additional backup on days with minimal sunlight. As a result, full off-grid system is generally much more complex and costly than the other two categories listed here. Arizona’s largest utility company charges more per kilowatt-hour during peak demand hours, this is suppose encourage customers to use less power during those times. As you can imagine, this is not a popular practice. By incorporating a PowerBank battery system you’ll be able to draw stored power during these peak billing times to reduce your energy consumption, saving your business money. While this option is possible, due to the high costs of massive battery banks it would take to store all the solar energy your business would need, a completely off the grid solution might not be a financially smart solution. The return on investment might not be there, but if uninterrupted power and security is your top priority, we will be happy to talk to you about your off-grid power options.